Conveyor systems allow for quick and efficient transportation of a wide variety of materials, ranging from heavy and bulky materials to light and easily transportable items. Conveyor systems are practical for applications that involve the transportation of bulky, heavy materials. Our high-quality conveyor systems feature easy installation and the ability to transport materials safely from one level to another, and they are able to easily transport materials of all shapes and sizes. Our team of experts can provide personalized consultations and support for all of our conveyor systems, regardless of style or quantity! 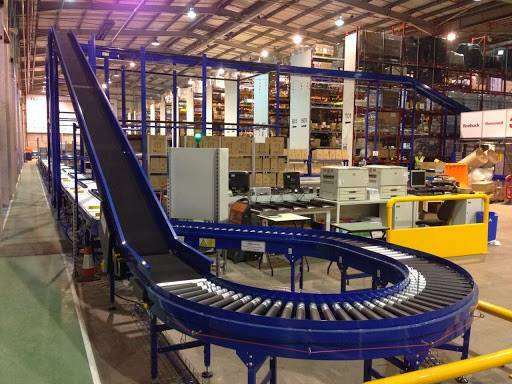 At Pacific Bend Inc., we only offer top-tier conveyors that boast high-quality material and an affordable price. Accidents are easily prevented with established, advanced safety features, and conveyor systems are safer to use than forklifts or other machines that move materials. Pacific Bend Inc. can provide popular brands at your request and can provide custom conveyors small, large or any size needed. To help you better understand the different conveyor systems, visit our blog, where we break down everything you need to know about the systems! The thought behind the Pick Module is to optimize flow efficiency of products. Palletized loads are moved by gravity through the system before being broken down into pieces, then sent to pick areas and finally shipped to the consumer. Integrated conveyor and sortation systems along with technology guide the flow of inbound materials and products through the order implementation stage.